Many of the special dishes from the wonderful world of Jewish cookery have been handed down from mother to child for countless generations. In the process, they have picked up some ingredients which, in the light of new knowledge of nutrition, are definite no-no's. They may be kosher, but they are neither wholesome nor nutritious. In fact, they have been proven to be harmful and have contributed to high blood pressure, obesity, atherosclerosis, and other debilitating conditions that one can live very nicely without. To remedy that, in 1983 nutritionist and cook extraordinaire Jane Kinderlehrer wrote the immensely popular Cooking Kosher the Natural Way. 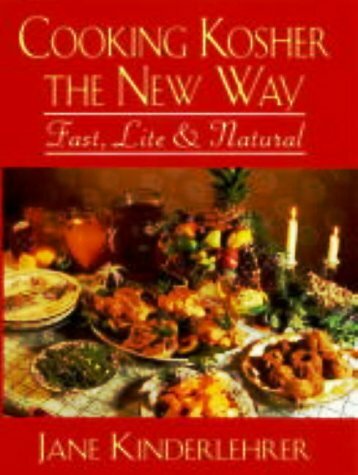 In Cooking Kosher the New Way, a thoroughly revised and updated edition of her earlier work, the former editor of Prevention magazine presents the very latest in nutritional information along with new recipes that are low in fat, virtually salt-free, and without refined sugar or artificial sweeteners. Here you will find fluffy knaidlach (matzo balls) swimming in chicken soup; golden knishes filled with potato, kasha, or cheese filling; health-building kugels of all kinds; soups both hearty and delicate; and on and on. You will find recipes for the traditional and the innovativeand all of these marvelous dishes are guaranteed to be nutritious even as they are delicious. In Cooking Kosher the New Way the emphasis is not only on good health, but on ease of preparation as well. Taking advantage of modern kitchen conveniences, Jane Kinderlehrer has created dishes that can be prepared with a minimum of effort without sacrificing that traditional Jewish tam (taste). In her own delightfully warm style, she clearly shows us that cooking fast, lite, and natural is the new way for the kosher cook.